It's been quite a while since I read any comics and am thus quite behind with general lore, but since my sister was kind enough to get me this as a gift, I figured that I could try it and see how well it read. And considering it's a Batman comic, one of my favourite superheroes growing up, at least it's a hero that I can try and get invested in again. Batman is on a new case, looking into the disappearance of beautiful socialite and childhood friend of Bruce Wayne, Dawn Golden. While he soon finds that Killer Croc and the Penguin are involved with her disappearance, there is something stalking the streets of Gotham that is far more dangerous and is inextricably linked to Dawn Golden. Can he find her and unravel the mystery in time to save her? Golden Dawn just left me so unsatisfied, which is really disappointing considering that I really do like Batman, as well as the fact that it was a gift. So, where to start. I guess I will start with the fact that despite this apparently being the beginning of the Batman The Dark Knight series, I was left really confused because despite needing a fairly in-depth knowledge of Batman the book doesn't really try to bring new readers up to speed at all. For me, this was primarily the presence of the character Etrigan. 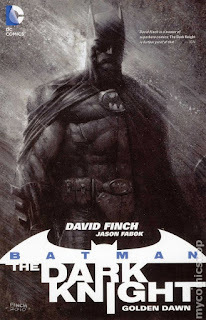 Up until now, I had never come across anything where he was a prominent character, so to just drop him into what I was expecting would be a Batman-only story was most disconcerting. To more DC-savvy readers, his presence might make perfect sense, but to me it was like "and now, a demon in your regularly scheduled Batman comic". And considering that it turns out that the whole demon thing is really important to the main plot of finding Dawn Golden, it does make proceedings that little bit more confusing. It might just be me though, I can never quite get my head around Batman having magical enemies. I can accept that he lives in a world with magic, but usually that stuff gets sent to characters like Wonder Woman or maybe Zatanna. To put Batman against a demonic cult just seems jarring and inappropriate somehow. Additionally, I'm not quite sure why the writer thinks that I will be especially concerned about Dawn Golden's fate. I mean, ignoring the fact that her name is all kinds of awkward and irritating in the light of the comic's subtitle, there isn't really anything there to latch onto with her character. They try and raise the stakes by having her be one of Bruce Wayne's childhood friends, except that there's only one scene of the two of them as children and all it told me was that she was a sullen girl who loses her friends' toys. Thrilling stuff. Her secret backstory is told later in one rushed, uninteresting splurge that didn't really add much to her as a character. The final thing that bothered me was an art issue. While the general quality was very polished, the artist seems to have an issue when it comes to drawing women. At one point, a woman steals the Batmobile and for several pages I could have sworn that it was Dawn. It was only when Batman found Dawn that I realised my mistake. When your character faces and designs are that indistinguishable from one another, it doesn't matter how pretty they are because you have just hobbled the clarity of whatever your story-telling is trying to achieve.